In the immediate aftermath of the Canberra bushfires of January 2003, Australian Prime Minister, John Howard referred to the devastating blazes as ‘our summer terror’. Seeking to draw a parallel between the conflagration and the still-raw horror of the terrorist attacks in the United States, Howard’s emotionally-charged phrasing was calculated to evoke global sympathy and to encourage a sense of community in adversity among Australians. Howard’s vision of the ‘summer terror’ works to create what the sociologist Benedict Anderson has termed an ‘imagined community’, bringing together individuals who have nothing in common beyond their shared nationality, and uniting them behind a common cause. For Howard, the enemy is clearly the fire itself, although if we think about his rhetoric a little more critically, we might ponder the contributions of drought, sun, wind, lightning strikes and Canberra’s famed pine plantations to the catastrophe. His attempt to draw on the deep emotional responses to 9/11 was, though, not designed to be unpacked, but rather to directly transfer affective responses (or perhaps emotional capital) from the North American context to Australia. John Howard’s canny efforts to unite a nation quite literally under fire are nothing new. As I’ve discussed in a book chapter, ‘Surviving Black Thursday: The Great Bushfire of 1851’, many nineteenth-century fire stories sought to create unity through crisis. Mid-Victorian stories, like Ellen Clacy’s fabulously melodramatic, ‘A Bush Fire’ (1854), frequently emphasized the indestructability of the homestead, which offers shelter against the hostile burning environment. A little later in the century Anthony Trollope’s Harry Heathcote of Gangoil (1874) stressed the need for settlers to put aside their differences, uniting to combat arson attacks. Different though these two stories may appear, they share a common investment in fire as a type of social leveller. Ellen Clacy’s heroine, Julia, must be rescued from a fire that represents her own repressed desires before she can accept the suit the shy—and socially inferior—sheep-farmer, Hugh Clements. Trollope’s Harry Heathcote must tame his arrogance and class prejudices to discover ‘mateship’ in the bush, with his neighbour (and eventual brother-in-law), Medlicot. Clacy and Trollope both explore fire as a plot device to bring about unity in a less socially stratified country than the England they knew. However, bushfires have also been mobilized in more overtly political ways, during times of conflict, when the propagation of an imagined community, unified against a hostile foe, formed an important propaganda tool. 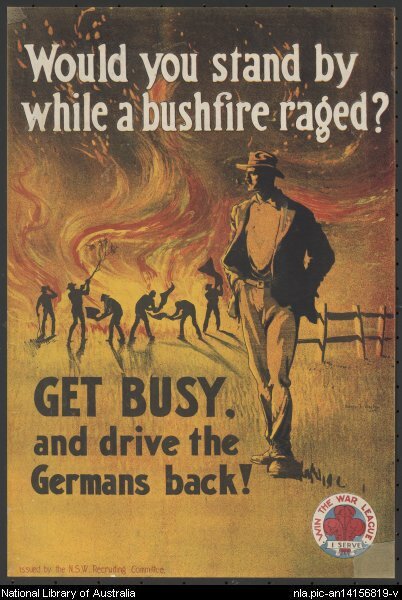 HJ Weston’s famous recruitment poster of 1918 asks, ‘Would you stand by while a bushfire raged?’, whilst urging, ‘get busy and drive the Germans back’. The poster neatly displaces the annual trepidation and terror of the fire season onto a geographically distant enemy. Moreover, given the debates about nationhood and the sacrifice of young Australian men for an indifferent mother country that circulated throughout the Great War, Weston’s poster masterfully transforms the European conflict into an urgent and pressingly familiar problem. In Melbourne, more than a million inhabitants were subjected to restrictions upon the use of water…The rich plains, denied their beneficent rains, lay bare and baking; and the forests, from the foothills to the alpine heights, were tinder…Men who had lived their lives in the bush went their ways in the shadow of dread expectancy. But though they felt the imminence of danger they could not tell that it was to be far greater than they could imagine. They had not lived long enough. The experience of the past could not guide them to an understanding of what might, and did, happen. Stretton’s insightful, sensitive and quite beautiful prose draws upon a collective understanding of waiting for a fire whose outbreak is inevitable. Whether his readers dwell in the country or the city, Stretton writes with the assumption of an instinctive understanding of the arid ground and the murderous effects of a hot summer. Primarily a political document, Stretton’s report is also a deeply moving and compassionate account of the day when, as he puts it, ‘it appeared that the whole State was alight’. I anticipated an advancing wall of flames, leaving blackness behind, being held back by natural and artificial clearings, by beating and by water. The reality was not like that at all: A bush fire is not an orderly invader, but a guerilla. It advances by rushes, by little venomous tongues of fire in the grass; it spreads by sparks burning leaves and bark. Its front is miles deep. It is here, it is there, like a swarm of venomous wasps. It shams dead and stabs you in the back (47). Surprised by both the scale and the unruliness of the fire, Wells couches it in adversarial terms, anthropomorphizing it as a malicious invading force. As his account unfolds, he goes on to stress the camaraderie inspired by the disaster, noting that the fire ‘exhilarates’ and asserting with great force that ‘bushfires eliminate class and feuds’ (49). Wells’ position here is remarkably similar to that of Anthony Trollope in 1874, with his suggestion that destructive fires promote egalitarianism and mateship. This emphasis on community-building is one reason for the bushfire’s great strength as a rhetorical tool for politicians, yet Wells, with characteristic controversy, took his analysis a step further. Perth, Adelaide or Brisbane could be wrecked or even occupied, while Sydney or Melbourne looked on incapable of help; for purposes of mere defence they carry isolation to its logical consequences. Like these scorched homesteads we visited, their real and effective protection lies in going to the source of the evil and beating it out there in time (51). Wells’ conflation of fire and enemy occupation demonstrates just how threatening he found the largescale burning. Yet his imaginative leap from scorched forests to aerial bombardment seems, at face value, to be a big one. There were discussions in the immediate aftermath of the fires as to how aircraft might be used more effectively to quell the flames and the Stretton Report recommended a much more systematic use of planes on days of fire danger. The movement from bombardment with water to an air offensive with weapons is, for Wells, an obvious next step from his vision of enemy fire-lighters. In the process, his broad-brush approach to the deadly burning turns it into a powerful political trope, creating not just national unity, but kinship with Britain and her allies too. His imagined community thus takes on a global, or perhaps imperial, dimension. Bushfires hold, because of their capacity to devastate landscapes, homes and communities, a potent and evocative place in the imaginations of many Australians. While wildfires and forest fires occur with increasing frequency across the globe, the intensity of the Australian summer renders the bushfire separate and different in terms of both its scale and the difficulties involved in fighting it. It is hardly surprising that this annually-appearing common enemy should have been harnessed by politicians and writers as symbolic of an Australia under attack. Images like the surviving chimneys that I wrote about in my last post, or the iconic photograph of Sam the koala drinking from a fire-fighter’s water bottle in 2009, instantly appeal to a sense of collective identity that encompasses tragedy, loss, heroism, mutual support, neighbourliness and rebuilding. The bushfire has become a repository for a wide-ranging collection of emotions and its political usage therefore warrants a considerable degree of further scrutiny. Grace Moore will be convening the ‘Fire Stories’ conference at the University of Melbourne from 4 to 6 December 2013. You may view the call for papers here: http://www.historyofemotions.org.au/events/fire-stories.aspx Abstracts of no more than 400 words may be sent to fire-stories@unimelb.edu.au by no later than August 31. *Wells was in Australia to address a meeting of the Australian and New Zealand Association of the Advancement of Science in Canberra. As one of the Five Agents or Five Elements wu xing of wood, fire, earth, metal and water, fire can be both an ‘enemy’ or an ‘ally’. It can cause destruction like the 2009 Victorian bushfire, but it can also be an agency for transformation and change as in using fire to cook our food and to give us warmth in the cold winter season. Absolutely. And I’m very interested in how understandings of fire change for those who moved from the Northern to the Southern hemisphere in the nineteenth century. Thanks for your response. Did the prime minister really compare bushfires to the attacks on the United States…. He didn’t explicitly draw the parallel–you can see a transcript of what John Howard said here: http://australianpolitics.com/news/2003/01/03-01-19.shtml My point is that in 2003, the term ‘terror’ was highly evocative (and loaded with emotion) and a number of journalists picked up on the word and its usage. I don’t think that John Howard’s usage was accidental. Since I am unfamiliar with the bush fires, were they started by on purpose or accidentally? If a group or member started them intentionally, I could try to understand the comparison a little more.